Growing up is a challenge, but it’s even more difficult when you’re an alien trapped in a human mean girl thanks to a madness-inducing jacket. Loma Shade survived the horrors of high school in the first volume of Shade, The Changing Girl, but after the “Milk Wars” event, it’s five years later, her alien body is gone, her high school friends are in college, and her grip on reality is shakier than ever. DC’s Young Animal books have undergone a change in title and status quo after “Milk Wars”, and while Shade, The Changing Girl has become Shade, The Changing Woman, the creative team remains the same. Writer Cecil Castellucci, artist Marley Zarcone, and colorist Kelly Fitzpatrick have crafted a deeply strange and heartfelt story in this series, and while the weirdness quotient is steadily increasing, the book is still rooted in the personal struggle to create and maintain an identity during harrowing times. 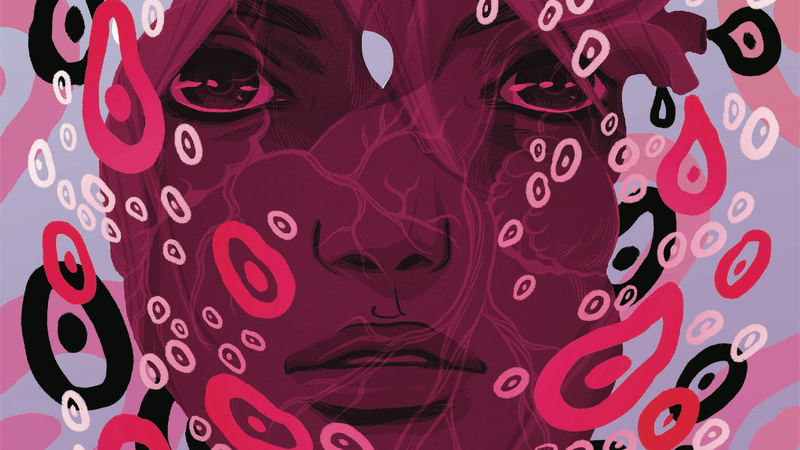 This exclusive preview of this week’s Shade, The Changing Woman #2 showcases the book’s psychedelic visuals as Loma interacts with her idol, Rac Shade, the main character of Vertigo’s Shade, The Changing Man back in the ’90s. This tether to the past ties into the story’s major theme of time, which is a key element of this excerpt as Rac spurts various time-related cliches while Loma ponders the next steps in her life. The malleability of time is represented literally in Zarcone’s artwork, and the first page has Loma clinging to Rac while digital and analog clocks swirl around them, creating visual chaos that reflects Loma’s mental state. Kelly Fitzpatrick’s colors uses different gradients and patterns to intensify that feeling of disorientation, and when Loma moves out of her mindscape and into reality, she brings that visual instability with her. The story and artwork are intricately connected in this series, and as the central character evolves, this team’s creative chemistry only grows stronger.